The sketchbooks of Percy Kelly 1918 - 1993. Hard back full colour. Today a piece of charcoal or chalk is like an extension of my forefinger. Drawing is as natural as walking. Percy Kelly began to draw as soon as he could hold a pencil. He didn`t draw like a child. He had an innate understanding of perspective, draughtmanship and balance. 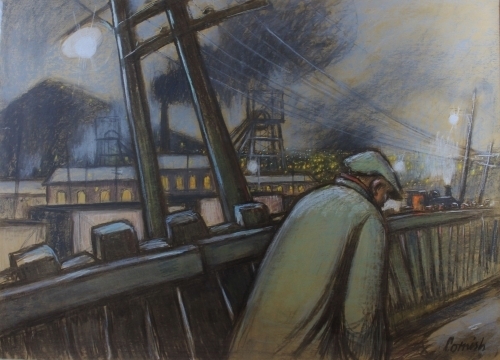 He drew or painted every day of his life even through his army service in the second world war often in defiance of orders to send his materials home. In his first job in the postal service he would occasionally draw on the mail he was about to deliver until there was a complaint from one recipient. He drew on plastic plates in hospital. He drew on the back of cereal packets and envelopes. He drew and painted on anything in his orbit. It was a compulsion. A day without drawing plunged him into depression. It was as necessary to his health as eating and drinking. He was always reluctant to sell any of his efforts. He liked them all around him which meant when he died in 1993 aged 76, he had a cottage stuffed with paintings and drawings, prints and letters. He preferred to live in poverty than sell any work. He hated exhibiting his work and was highly critical of galleries. After his death in 1993, Chris Wadsworth brought his life`s work back to his native Cumberland and has been his champion, building his reputation from nothing. In the last 18 years she has gathered information from many sources, built it up piece by piece like a jigsaw and now is ready to tell the story of the extraordinary life of Percy Kelly which began in a terrace house in Workington, Cumbria, through Cornwall and Brittany to a derelict house in Pembrokeshire and a cottage in the backwoods of Norfolk. On that journey he discussed art with the Prime Minister Winston Churchill during air raids, shook hands with the King, George VI, at the National Gallery and dined with members of the Royal family. He corresponded with some of the highest in the land and ended up lonely and confused in a cottage in Norfolk surrounded by his beloved collection of work. A piece we recently wrote for Cumbria Life, focusing on Investing in, and displaying Art.